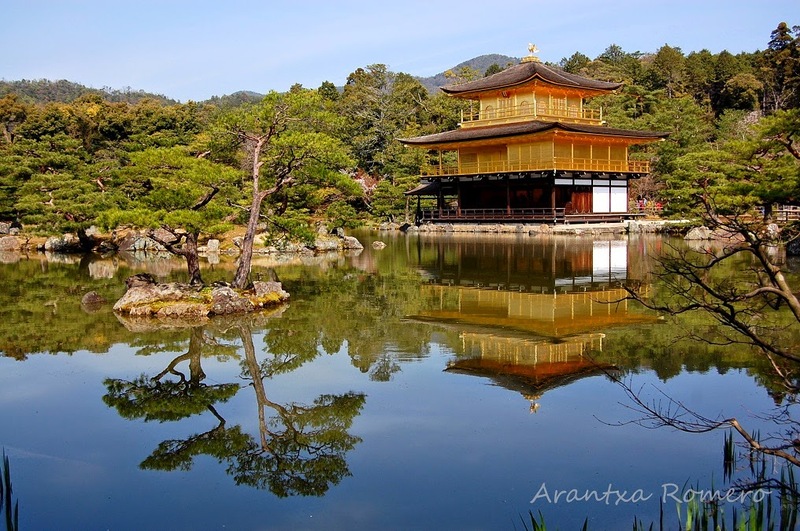 One of the must-visit in Kyoto is the Kinkaku-ji, or Golden Pavilion. No wonder why. Since it was a sunny and cloudless day, the reflection on the water was perfect. We tried to get there early, to avoid the crowd, but between trains and buses (BTW, buses have a standard fee and it's paid when you leave the bus), we arrived there at 9am, and it already super-crowded. Uno de las visitas obligadas en Kyoto es el Kinkaku-ji o Golden Pavilion (Pabellon dorado). No hay dudas de por que. Como ese dia habia sol y no habia ninguna nube, el reflejo en el agua era perfecto. Intentamos llegar alli temprano, para evitar encontrar alli a mucha gente, pero entre trenes y autobuses (los autobuses tienen tarifa standar y se pagan a la salida), no llegamos alli hasta las 9 de la mañana, y ya esta lleno.